Soluble cleaning sachets - add 1 sachet to water for a commercial grade cleaning product. 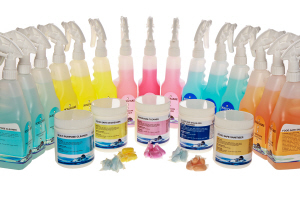 Soludoz and Solucaps provide an innovative method of cleaning. A specific cleaning powder is encapsulated in a water soluble sachet which, when added to a volume of water, creates a perfect cleaning solution. This eliminates the well known and costly problem of cleaning staff commonly making up a stronger solution than is required. Also, because the sachets are dry, compact and light, they reduce storage space and transportation costs, as well as avoid spillage problems and are cleaner and safer to handle. FLOOR AND WALL DEGREASER - Formulated to clean and degrease all washable surfaces. Floor and Wall Degreaser contains strong grease cutting components and requires little to no rinsing or refreshing the surface. Eco-friendly.